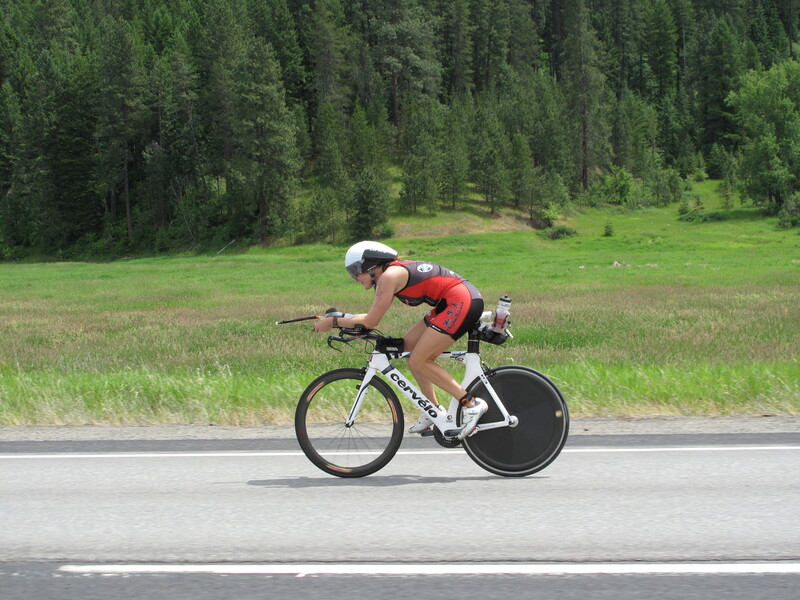 IM Coeur d’Alene was my 3rd Ironman® Event. My first was IM AZ in 2010, my 2nd was IM Canada in August of 2012. My goal for IM Canada was a Kona slot. 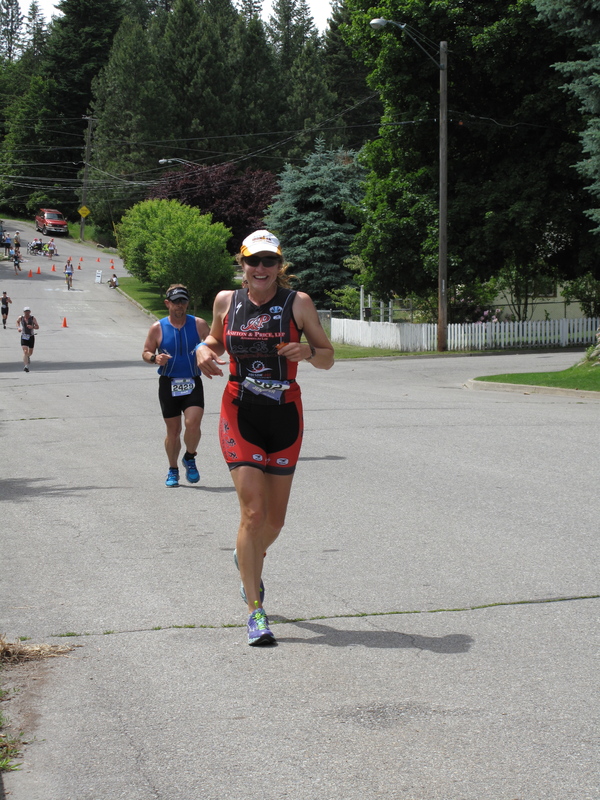 When I placed a disappointing 20th I knew I had some unfinished business with Ironman® and hastily signed up for IM Coeur d’Alene a mere 10 months later. What was going to be different this time around? I joined Endurance Nation for some guidance. I was impressed with their philosophy of quality vs. quantity training. I knew I could not waste any time this year. I basically had to beg my husband to let me do another IM so soon, and I promised him I would train as “invisibly” as possible. I completed the November “outseason” , followed by the “get faster” plan. I did increase the volume a bit, as I had planned two early season half ironman races. 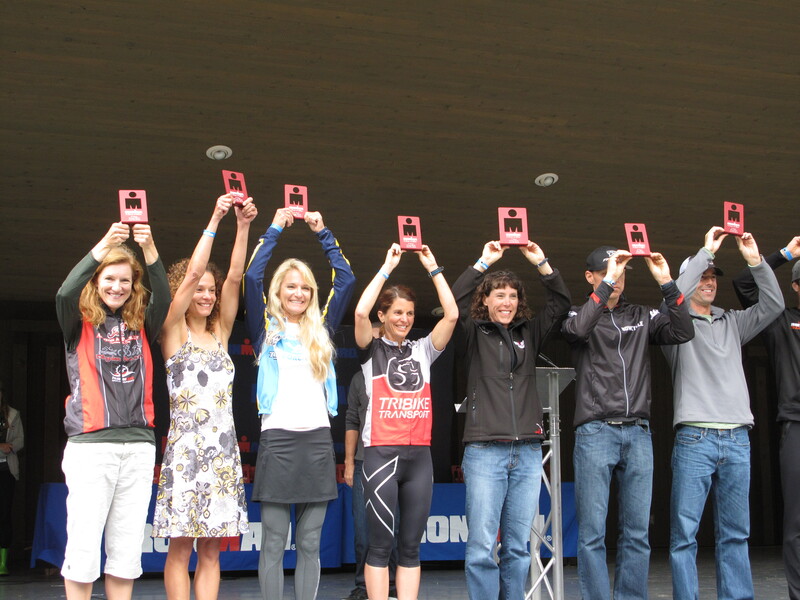 I placed 1st in my AG at Napa Valley HITS, but then bonked hard at Wildflower. I completely revamped the nutrtition strategy that I had been using for 3 years with only 6 weeks to go before IM CDA. A big thanks to Sheila Leard, Joe Santos, and Lynne Keane for your help with this! I also changed my bike fit 2 weeks prior to the race! I had done my 2nd Race Rehearsal and was having an unacceptable level of discomfort/fatigue in the neck and back. Big thanks to Mike Beretta for squeezing me in during his lunch hour! Needless to say, I went into the race a bit doubtful. Last minute changes are never recommended, but I also didn’t want to follow my nutrition plan and bike fit plan “into the brick wall”. In retrospect both of these changes were a critical strategy for my success. We left home 10 days before the race. We took a family road trip through Eastern Oregon before landing in CDA. This was a very relaxing week. It really helped to be away from work and other athletes during this time. I was relaxed, but truly not looking forward to the race. I was actually dreading it. I had zero motivation to participate, let alone race! When we arrived in CDA it was raining, hard. This did nothing to increase my mojo. I was not at all looking forward to the race in 3 days. I pulled myself together, and went for a practice swim on Friday. I was in the water a whole 8 minutes! Yep, it was cold! On Saturday the weather cleared, I had not been on my bike in almost 2 weeks. I did a 30 minute spin to make sure everything was in working order before checking my bike in. On Sat morning I did an easy 30 min . run only to keep from going completely crazy. Awoke at 4 am. Ate about 2 cups of steel cut oats mixed with about 2 TBS of peanut butter along with a banana. Arrived at transition around 5:15. Checked bike tires, reviewed where my transition bags were, stood in line forever for the porta potties, and then got in wet suit and headed to swim start. This was the first year of the rolling start. I got in the water 15 minutes before the start, swam for about 7 minutes and then got back on the beach to wait for my start. I lined up with the 1hr- 1 hr and 15 min. group. Gun went off at 6:35 and I was in the water within 3 min . There was still quite a bit of contact. My goggles were knocked off partially and I took a pretty good jab to my ear. The nice thing about this start format is that it appeared most people seeded themselves correctly , therefore there were few slower swimmers to swim around. I found myself swimming along pretty well with few obstructions until the first buoy turn. Both turns were quite congested. I took a few more knocks and then was back on course. After the first lap, you get out of the water, run across a timing mat, and back into the water for a 2nd lap. The 2nd lap was fairly uneventful. This time I took both turns wide to avoid the congestion around the buoys. Out of the water, ran to the wetsuit strippers, then into the bathroom for a quick pit-stop. No arm warmers were necessary as it was already in the 60’s. A little slow due to the bathroom stop, but otherwise uneventful. Headed out on the first out/back on the bike course. Went for a drink from my speedfill aero bottle and the whole nozzle came out in my mouth! Spent some time trying to finagle the zip ties off the straw, remove the insulating sleeve, and find the rubber tubing in order to jam the nozzle back in… AARRGGHH. Mission accomplished, but a little stress and slow riding during this process! Rode that first out/back quite comfortably and then headed out on the highway for the next out/back segment. I found myself riding very relaxed at a moderate/steady pace. I kept waiting for the “big hill” at the end that never came! I was at the turn-around before I knew it ( I did develop a stomach cramp at mile 40 which stayed with me for the duration of the bike. I had to adjust my nutrition plan , easing up on all food besides water for almost an hour. When the cramp refused to go away, I started taking in bananas from the aid stations. They went down pretty smoothly and although the cramp remained it did not get worse! )Back into town to complete the first lap. First lap was 2:50. Wow! I was on track for a 5:40 bike split! I slowed down as the winds kicked up a bit.on the second loop. The hills were definitely there the second time around. I was ready to be off the bike by about mile 80, but continued on and finished the bike fairly comfortably. Unbeknownst to me I came off the bike 2nd in my Age Group! I felt quite wobbly coming off the bike. Hustled into the bathroom once again , then into the changing tent and back off on the run. The changing tent was fairly empty, but it did not dawn on me at the time that it was because I was near the front of the pack. I should note at this point that I had put a Kona Slot out of my mind. I was going into CDA “running my own race”. According to previous years, I would need to go under or right around 11 hours to make the top 3. My training had not supported that kind of speed. I was out to do my best, beat my Canada time and take a break from Ironman® for a while. Began the run at a very slow pace (complying with Endurance Nation execution strategy). It was hard to run this slow. I was aiming for 9:27/mile pace, the first mile was 9:11, 2nd mile 9:18. From there I consciously tried to slow it down. I finished the first 6 miles very comfortably. I continued to run “within the box”. I did not try to pick up the pace, but just run at whatever pace felt comfortable. This turned out to be around 9:30 pace anyway. I hit a rough patch between mile 15 and 20. This was earlier than I expe cted. I continued to walk through the aid stations, but I was taking more than the recommended 30 steps. I kept focusing on my fueling plan ( Power gel every 4 miles). My husband caught up with me around mile 19 and told me I was in 5th place. He advised me to “dig deep” . He also mentioned that I could sit in the med tent all night with an IV if necessary. I tried to pick up the pace as best I could. I tried to spend less time at the aid stations. I kept moving ahead, but could not close the gap between me and 4th place. I must say the finish chute was truly incredible! I was running pretty much alone all down Sherman Street ( the last 2 blocks). The spectators were all clapping and cheering. I felt like a rockstar! Overall finish time: 11:36:50, 5th in AG. My body temp. dropped quite rapidly. I have a history of vomiting after finishing my last 2 IM events. Went right to the med tent and got under a heavy blanket. Had 2 cups of chicken broth, sat there and chatted with a great guy from San Antonio and was on my way in about 45 minutes. NO VOMITING!!!! 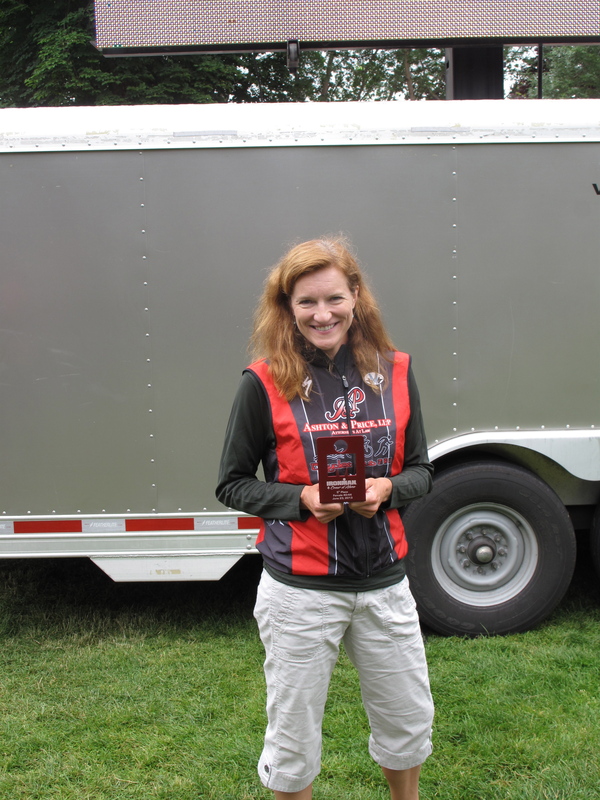 Although I missed the Kona spot, I still made the podium and was able to receive an award at the award ceremony . This was pretty cool. I keep wondering “what if I had known my position sooner? Could I have pulled it off?” I will never know the answer to that particular question, but I do know I have to try again.